CANON BOB EVANS, M.B.E., M.N.M. Well-known to tens of thousands of Liverpool Seafarers over a period of almost fifty-five years, Canon Bob Evans is the most iconic figure in the Liverpool Shipping commiunity. KASKELOT in Canning Dock, 1987. 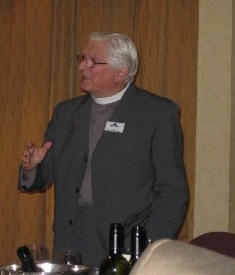 Canon Bob Evans was awarded the M.B.E. 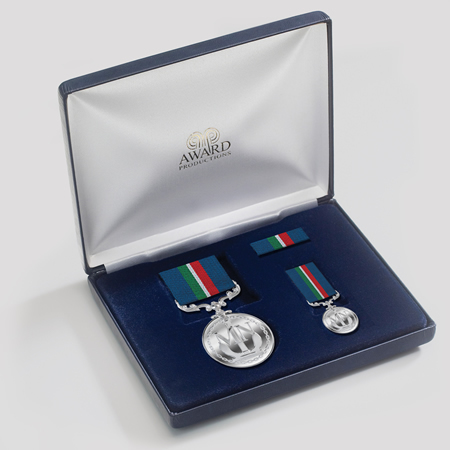 in the Queen's Birthday Honours in June 2008. 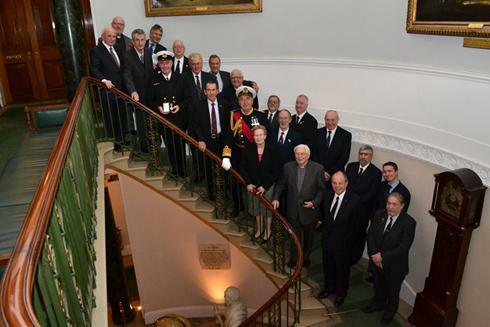 His many thousands of friends on Merseyside and across the world joined together in offering heartiest congratulations and best wishes to Bob for this much deserved honour which recognises almost fifty-five years of unstinting work looking after the welfare of seafarers on Merseyside. "They that go down to the sea in ships and occupy their business in great waters; these men see the works of the Lord and his wonders in the deep"
Seafarers also see and feel the heights and depths of human emotion in the hazards that they face through separation from their homes and families. They need a special sort of person to support them when they have problems or are feeling low. Bob Evans is that special sort of person. Sick and destitute foreign seamen, often not understanding the English language, have contacted their families and found their way home with Bob's help. 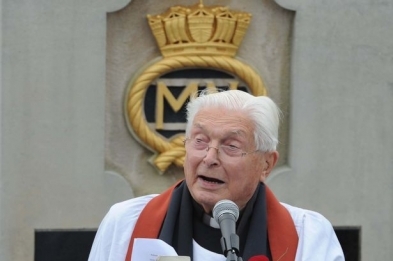 Many young midshipmen and officer trainees have received friendly and sensible advice through the Mersey Mission to Seamen where Bob Evans was Chaplain Superintendent from 1962 to 1989.
become a prolific and successful author. Bob commenced his Ministry working in a South Wales mining valley, then on to a barren estate alongside the Dowlais Steel Works in Cardiff, and finally in Llandaff Cathedral. 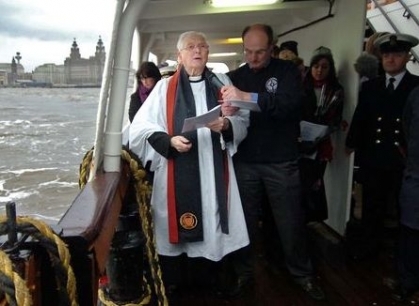 After that, and as he admits in complete ignorance of seafaring, he joined the Mersey Mission to Seamen (the name was changed to 'Seafarers' in 2000) as an Assistant Chaplain in 1961, only to find himself just nine months later the Chaplain Superintendent. Bob reckons that no-one could have been more nervous than he when he set out to visit his first ship in Liverpool with dis dog collar to the fore. 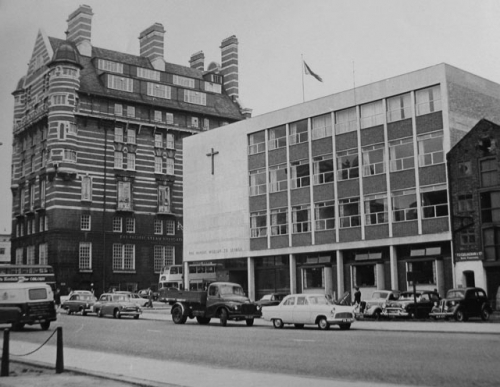 Bob Evans recalls organising dances in 1962 at the Mission, then housed in Kingston House at the foot of James Street, Liverpool: 78rpm records, all 'strict tempo' and Victor Sylvester. He soon realised that a live band was essential and the 'Hignet Quartet' was engaged three evenings a week from mid-March. What Bob had not realised was that just around the corner from the Mission, in the basement of an old warehouse in Matthew Street, there was the start of a musical revolution that would turn the world up-side-down. Soon the 'Hignet Quartet' was replaced at the Mission by the Liverpool Police Band, four members from which played every night of the week. 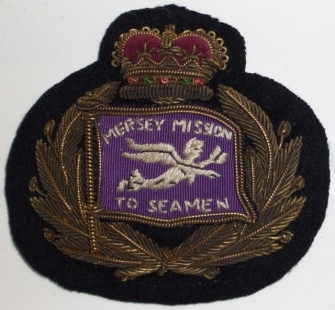 There was no need for 'bouncers' - the Mersey Mission had the best music and the seafarers came in their thousands. to Seamen, photographed in 1962. On the left is the White Star Building. Ever Thursday evening in the 1960s, Bob Evans would visit the Blue Funnel Line Company Hostel at Riverside, south Liverpool, and eat dinner with seven of the newer cadets. After dinner, they all adjourned to the library for coffee. As the cadets (or 'midshipmen' as they were known in Blue Funnel) had no choice but to go along with this, Bob unashamedly brainwashed them about the dangers of the seafaring life, especially booze, women and disease! 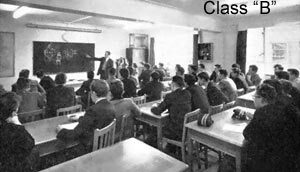 He advised them on how to make the best use of the Flying Angel Clubs (the world-wide equivalent of the Missions to Seamen in the U.K.), and stressed the importance of writing home regularly. In his autobiographical account of his time with the Mersey Mission to Seamen entitled 'A Dog Collar in the Docks', Bob Evans recalls his first trip on a Liverpool Pilot Cutter out to the Bar Station. Following lunch on the cutter, Bob was transferred, along with the Pilot, to an inward-bound vessel - the OCTAVIA. He recalls leaving the pilot cutter in the punt and heading across to the OCTAVIA in choppy seas. Up went the pilot, and then Bob's case. The ship towered above the punt like a three-storey building and down its side dangled a rope ladder. Bob was encouraged to believe that there was no problem, although one apprentice did helpfully suggest that he should get it right first time! He waited until the punt was on the crest of a wave and then grabbed hold of the ladder. The punt dropped into a trough and Bob was stranded - so up he went. At the top were members of the OCTAVIA's crew, somewhat surprised to see a Padre. Bob was hauled over the rail by the scruff of his neck. However, it proved to be an excellent way of introducing himself to a ship's company, one that he repeated many times in the ensuing years. bound vessel at the Mersey Bar. Boarding the OCTAVIA on that first occasion stayed in Bob's subconscious. It seemed to sum up a valid approach to life. Boarding that ship, in that way, had required a positive decision which, once taken, prevented any retreat. You could not stand still on the pilot ladder because the next wave was coming along! There was only one choice. Having taken the decision to go for it, you had to go up the ladder. Then came the surprise - Bob felt welcome on board - faces looked down from the deck with smiles, and hands were stretched out to haul him on board. All that was required of Bob was the first step and he would then be accepted by the seafarer. Head on Monday, 11th November 2013. 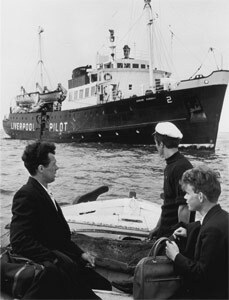 Just before Bob Evans retired from the Mersey Mission to Seamen in 1989, he was elected an Honorary Member of the Liverpool Pilots' Association, and was afforded the additional honour of being presented with a Liverpool Pilot Licence, First Class. 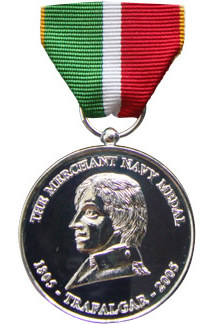 This was only the second time that such an award had been made in the history of the Service. 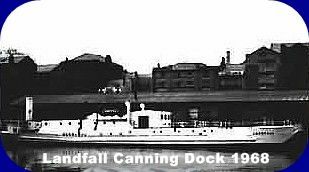 When Bob first came to Liverpool in 1961, he noticed across 'The Strand' from his office in Kingston House, an old tank-landing craft called the LANDFALL, sitting on the mud in about two feet of water in Canning Dock. This was the home of the Liverpool Master Mariners' Club, and Bob was to spend many happy hours on board with various clubs and societies, enjoying dinners after which tales were told well into the small hours. Bob Evans recalls a story which started with a telephone call from the Mission to Seamen Chaplain in Glasgow. He asked Bob to visit the Elder Dempster ship KABALA which had just left the Clyde for Liverpool, to meet one of the Nigerian crew who was being prepared for confirmation. Before Bob began the lesson he asked the man for his full name: "Fekeregha", came the reply. When pressed for his Christian name, the seaman replied: "I have no Christian name. Why should I? No-one in my home is Christian - they are all Mohammedans." Before the KABALA left Liverpool, Bob Evans baptised Fekeregha, giving him the name of Peter. Bob Evans never saw Peter Fekeregha again. Such is the life of a Mission Padre. Bob always felt that Peter was dead, given that civil war was raging in Nigeria at the time as the Muslim Hausas in the north determined to eradicate the Christian Ibos of the east. Since baptising Peter Fekeregha, Bob could recall at least three seafarers who visited him, and they all made the same comment when asked why they had approached Bob to talk about the Christian faith: "We have sailed with Peter Fekeregha." ELLAN VANNIN disaster of 3rd December 1909. Christmas at the Mersey Mission to Seamen always involved the Bar Lightship. 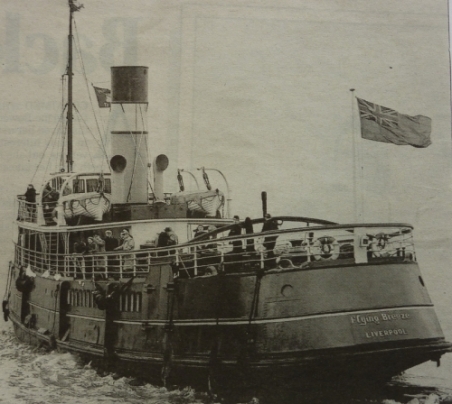 It had become tradtional for the Alexandra Towing Company's tug/tender FLYING BREEZE to sail out to the Mersey Bar in the week before Christmas, carrying hampers full of 'goodies' for the men on the lightship, a gift from the Mersey Mission to Seamen. masthead, and the Mersey Mission to Seamen's flag above the bridge. 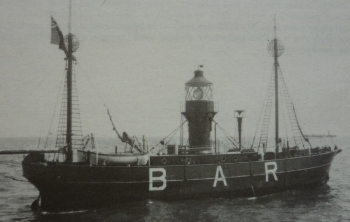 In the ten years that Bob Evans made the trip out to the Bar, on only three occasions was he actually able to board the lightship, because of adverse weather. That was when Bob discovered the enormous pride of the men in their work and in their care of the lightship. Every surface shone with polish. Bob inspected their living quarters and drank scalding coffee. Over the sides of the lightship was an array of fishing lines and he was able to return home with chunks of the freshest fish. Stage on 22nd December 1961. 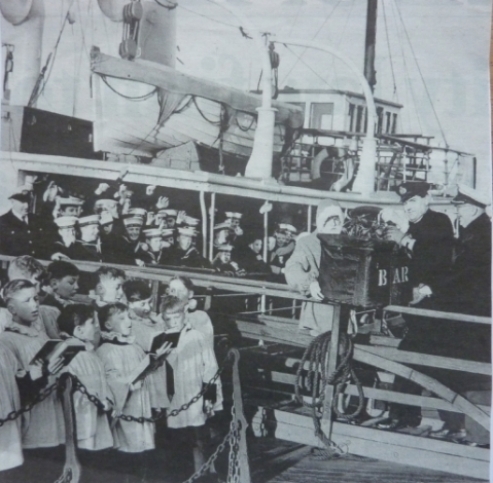 Bob Evans recalls that the Bishop of Warrington, Laurie Brown, always accompanied the annual trip out to the lightship with the Christmas hampers. Bishop Brown smoked a smelly pipe and regaled the company with amusing anecdotes. On arrival at the Bar, the hampers were slung across on ropes in fine nautical fashion, and everyone lined the sides of the FLYING BREEZE while television cameras turned and the seas heaved. Some fifty feet from the tug was the lightship, with all her crew assembled on deck. "When we were up, they were down," recalls Bob. The tugmaster was dressed as Father Christmas and "Ho! Ho! Hoed!" as the choirboys from St Gabriel's Church, Huyton, sang 'O Come All Ye Faithful'. In the midst of all this was the Bishop of Warrington, with his teeth out, parting with his breakfast over the side. One tugman quietly observed: "And we brought him along to raise the tone!" The FLYING BREEZE then blew three long blasts on her whistle, the traditional 'Sailors' Farewell', and set course back to Liverpool. The lightship receded into the distance, with her bell clanging and her crew waving oilskinned arms. The tug returned up the Queens and Crosby Channels with the marker buoys tilting and riding to the swell as she passed. Each outward bound ship sounded a greeting to the FLYING BREEZE as all aboard the outward-bounder bade sad farewells to Liverpool and prepared for yet another Christmas at sea. Liverpool Bar from 1912 until 1961. It always seemed calmer on the return passage and the whisky bottle appeared as if by magic, and by courtesy of Alexandra Towing. Suddenly all on board were starving. Sandwiches and pork pies were munched. On many occasions Bob Evans pieced together an article for the youngest of the reporters, as they returned to the land of the living after a severe bout of seasickness, so that they could present a copy and tell a tale. 'Mac' - the Liverpool Echo's cartoonist - spoke for everyone on the FLYING BREEZE that choppy day ....... "Sic Transit Gloria!" is in great demand as an after-dinner speaker. Just before Bob Evans' retirement at the end of his Ministry with the Mersey Mission to Seamen in 1989, he set out to walk from West Kirby across the sands to Hilbre Island in the company of his Liverpool Pilot friend David Hopkinson. The sky was clear with a strong westerly breeze. Bob was there for a special purpose. The reason was a small scrap of humanity, David's daughter, appropriately called Hilbre. Bob's pleasant task was to baptise her. The table was a weather-worn carpenter's bench from the last century, and there was no need to point out the symbolism of such an altar. The font was an upturned ship's bell, filled with water which had come from off Cape Horn. The Baptism was perfect, with all the wonder of the 1662 service. Bob Evans recalls: "I felt it was a perfect way to end my Ministry to seafarers on Merseyside." 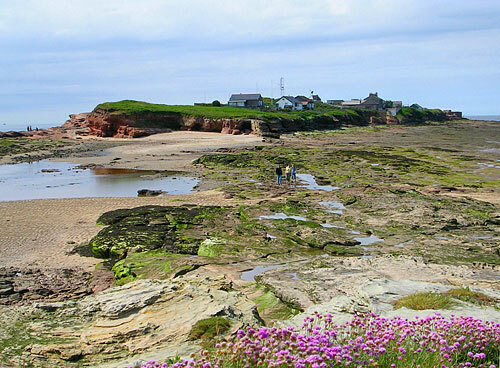 Hilbre Island, some two miles off West Kirby in the Dee Estuary. 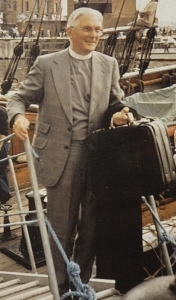 This article has been compiled by John Shepherd from 'A Dog Collar in the Docks', Canon Bob Evans' autobiographical account of the time he spent as Chaplain Superintendent to the Mersey Mission to Seamen from 1962 to 1989. Memorial at Liverpool's Pier Head. right, in the front row. GCB DSC ADC DUniv, who is in the centre of the photograph.